The burgeoning tourist trade between England and Europe, particularly Italy, triggered a neoclassical revival in art, objects and even literature. This revival also spurred a renewed interest in pietre dure, a micromosaic jewellery-making technique invented by the craftsmen of antiquity, perfected by the artists of the Renaissance and then revived again in Victorian jewellery. Micromosaic is an ancient art form dating back to antiquity. Based on ancient Greek and Roman techniques, it was first revived during the 16th century in the Medici-ruled city state of Florence. Local artists and craftsmen were commissioned to create a steady stream of magnificent and luxurious objects for noble and ecclesiastical patrons. The pietre dure produced during this creative era became known as Florentine mosaics. Regular micromosaic work consists of hundreds or even thousands of tiny glass fragments called tesserae, which are painstakingly embedded into a pinchbeck mount. Pietre dure is created by the inlay of a few larger pieces of hardstones, such as marble, lapis lazuli and malachite. The stones are sliced into thin layers of varying sizes, then cut with extreme precision to fit tightly next to each other. These panels are then inlaid onto a background of marble or, occasionally, slate. When several types of hardstones are used, the work is called pietre dure; when a single large stone is used, it is referred to in the singular –pietra dura. Originally used to create decorative tables and cabinets, the mosaic technique was reduced in scale for use in 19th century jewellery. The gold work framing the plaques became progressively more decorative, with fine scrolling and corded motifs. As shown in the piece here, the pietre dure technique is combined with Etruscan-inspired gold work to create a fine piece of Archaeological Revival jewellery. During the neoclassical period of the 1820s to the 1850s, art forms celebrated all things Italian, especially images of antiquity. Micromosaic jewellery often portrayed Roman ruins, landscapes, or mythological and religious figures from antiquity. Pietre dure, on the other hand, frequently illustrated more organic motifs, such as flora and fauna, butterflies and birds. The pietre dure plaques would commonly depict bouquets of flowers that conveyed complex Victorian symbolism. While micromosaic craftsmanship was applied to items such as pillboxes and snuff boxes, the most common displays of the technique were in pendants and brooches. Parures and demi-parures were fashioned in both pietre dure and micromosaic, yet it remains difficult to find a cased, full parure of bracelet, earrings and pendant or necklace. 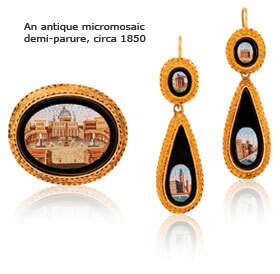 A demi-parure of just two micromosaic items is more common. Both pietre dure and micromosaics became souvenirs of the so-called grand tours of Italy, popular among the British elite in the 19th century. Much of it represented neoclassical Italian culture mimicking the mythological images of ancient Rome by well-known painters, as well as archeological excavations, such as the frescoes at Pompeii. It became increasingly intricate in design. While earlier mosaics were comprised of square tesserae of stone, terracotta, marble and glass, later works perfected the painstaking technique of employing threads or strips of glass. This method, called smaiti filati, was developed in the Vatican workshops and introduced a wider variation of new, vibrant colors and shapes. Still manufactured in Italy today, usually with much larger tesserae and lesser-quality workmanship, tourists with a trained eye can appreciate the age and quality of a micromosaic pieces. If it looks more like a painting than tiny pieces of tesserae, chances are it is older and more valuable.